A journey of identity is unique and personal to each person, the community they are exposed to and the lives they experience which shape their lens. It’s not universal and it can be as microcosmic as a city and a neighborhood. 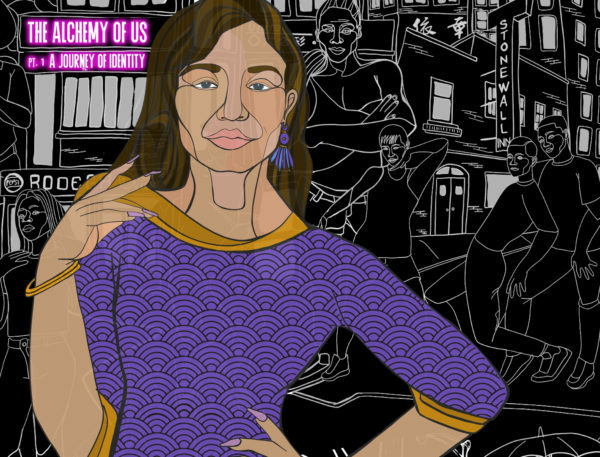 THE ALCHEMY OF US, A JOURNEY OF IDENTITY includes several new mixed media artworks by Artist, Sam Kirk, that share the narratives and experience of individuals in various marginalized communities. Throughout my life, I have been interested in the routes taken as we discover our identity. I am curious about the factors that contribute to our growth and the experiences that impact our ability to become our truest selves. This interest stems partially from my personal experience as a bi-racial, queer woman, growing up within marginalized communities. The core focus of my residency is Gender Visibility. In the current state of our world, where Transgender, Non-Binary, Non-Gender individuals are in a constant fight for human rights and recognition, I felt compelled to create work that went beyond gender. Over the past 8 months, I conducted interviews with individuals of various identities and gathered research from articles, books, alongside documentaries specific to the struggles within LGBTQ Communities of Color. My art career has been inspired by experiences in my life and the lives of others. Historic and current events can be seen throughout the work I create. Sharing stories of our journeys to create dialogues between cultures, generations, and communities, is what sparks change and growth. Tags: Chicago, Chicago Art Department, Lower West Side, Sam Kirk, The Alchemy of Us. A Journey of Identity.